Berlin is blessed with more than 40 specialty coffee shops and cafes bringing to the German capital some of the best coffee beans on the market, carefully crafted by knowledgeable coffee people and professionals from all over the world and served in unique and purposefully designed spaces. It is pretty exciting to experience the rapid growth of the third wave movement in Berlin first hand as it spreads from district to district. And while I love to tell you all about the most incredible spots on the Berlin coffee map (below), I am hoping to dive a bit deeper into the scene by introducing you to some of the incredible female coffee people that push the scene to excellence on a daily basis. % Arabica, a fundamental piece of Kyoto's coffee culture, moved to one of Kreuzberg's legendary courtyards in May 2018 to open their first European flagship store. Expect the same precision and quality as in other % Arabica outlets in Asia and the Middle East, coupled with timeless German design influences and a focus on the essentials. It's the perfect place to experience the flavours of the world's coffee belt one cup at a time, thanks to several 90+ treats used by baristas in competitions on the menu. In 2016 Bonanza Coffee Roasters expanded to find a new home for their roastery in a backyard of Kreuzberg. The best part: they opened one of the most gorgeous cafés in Berlin right with it. They've been around for over 10 years and are definitely one of the great pioneers from Berlin's early third wave beginnings. The founders Yumi Choi und Kiduk Reus are sourcing the highest quality beans from Nordic Approach, Trabocca and Antus Coffee from Colombia. Chapter One is a neighbourhood coffee shop in the Bergmannkiez of Berlin Kreuzberg. It is run by Nora and her business partner Björn since 2011. Multiple roasters are featured at Chapter One, including JB Kaffee, Flying Roasters, Johan and Nyström, Röststätte, Hoppenworth & Ploch, Ernst Kaffeerösterei and Episode #1, which is a coffee Nora produces together with Andraschko Kaffeerösterei. As the emphasis is on filter, various brew methods are available. You'll find the Syphon, V60, Aeropress, French Press and Chemex. Read more about Chapter One in my interview with co-owner Nora Šmahelová. Another Kreuzberg backyard jewel is Companion run by Shawn Barber and Chris Onton. The two friends met while working at the Barn when it just started out in 2010 and decided to launch a coffee shop together a few years later. When an opportunity presented itself to open inside Voo fashion concept store, they kick-started Companion within just 3 weeks. Today, you'll find different European roasters featured, such as Assembly, Nomad and Workshop Coffee. Where once a doorman was providing courtesy and security, nowadays Concierge are handing out espresso and flat whites. In 2013 Benjamin Pates and Namy Nosratifard gave the tiny space in a Kreuzberg backyard a new purpose by transforming it into a boutique espresso bar. In the adjacent Zola, a bigger place serving authentic Napoletan pizza, Concierge have stationed a stunning San Francisco Roaster on which they are working their magic. In terms of location, it doesn't get much better than this! The proximity to the canal is a great draw for promenaders or those you seek a fresh breeze. Westberlin is a coffee and media shop in the heart of Berlin located on the end of Friedrichstraße that is still part of Kreuzberg. The owner Kai Bröer, who is also an architect, launched Westberlin in 2011, when the area was still considered to be less desirable for investment. The interior is well thought-out and is influenced by Japanese and Scandinavian approaches to design. I love to come here to work as the ample space is very welcoming to people on laptops. The Scandinavian influence is reflected in the choice of beans as well, with Drop Coffee being a regular here for espresso brewed on a La Marzocco Strada. For filter and cold brew Westberlin is sticking to the local roastery Five Elephant. The specialty coffee shop Coffee Profilers is a joint venture by Stefanos Domatiotis, Yiannis Taloumis and Nora Šmahelová. The café opened in 2015 and is located in one of the iconic buildings along the boulevard Karl-Marx-Allee. Coffee Profilers are featuring exclusively TAF, a roastery based in Athens, both for espresso and filter options. Brewing options include V60 and Syphon. Read more about Coffee Profilers in my interview with co-owner Nora Šmahelová. Marian Plajdicko, Barista Champion of Slovakia, and Roland Lodr are the happy faces behind this bright coffee shop that is conveniently located a 2 minute walk from the Ostkreuz station. Being a multi-roaster café it is a great place to discover coffee from all over the world roasted by the best roasteries in Europe. I've stumbled upon Casino Mocca and Doubleshot for example, just to name a few. Do try their specialty: cold brew coffee charged with nitrogen! 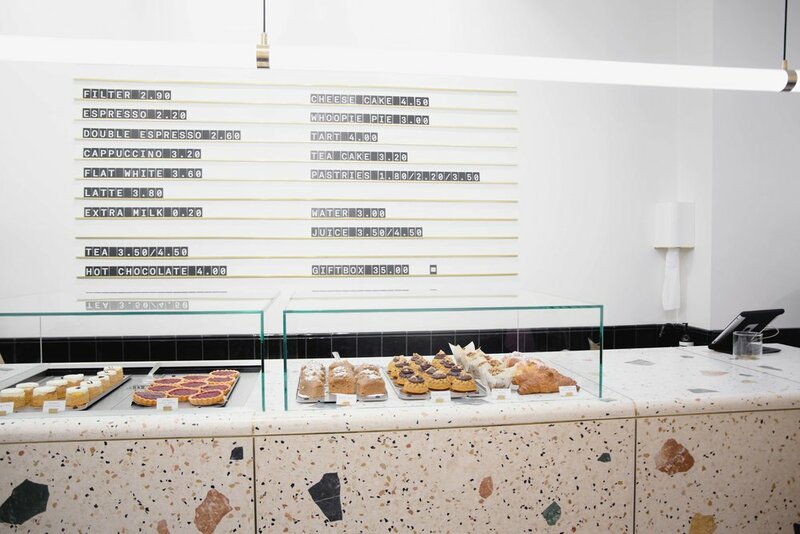 The cousins James Maguire and Morgan Love brought a piece of Australian breakie and coffee culture to Friedrichshain when they opened Silo in 2013. These days the coffee comes exclusively from Fjord, a roasting project that Silo is running in cooperation with Father Carpenter Coffee Brewers. A great address for brunch with a timeless rustic interior. Tres Cabezas is a specialty coffee roastery located in Berlin Friedrichshain. When Sascha Spittel and Robert Stock started with an espresso bar in 2002 they had no idea it would develop into a successful coffee roastery with three coffee shops in Berlin and a respectable retail business. Robert told me he still thinks it was a bad idea to start out at Ostkreuz, which back then wasn't a very desirable neighbourhood. But looking at what they've achieved it could have gone worse. Read more about Tres Cabezas in my interview with head roaster Bára Ernygrova. Tres Cabezas have come up with a yummy way to deal with the anticipation for Xmas! How about brewing a different single origin from 1st of Dec until the 24th? Their advent calendar is now available online and you can score a 10% discount! Just use the code Thewaytocoffee10. From the exposed brick walls coupled with wooden and metal design, to the high quality coffee and pancakes, there are so many good reasons to fall for this place! It is my number one go to spot for brunch in Berlin, even though I have to wait in line every time I come here. Distrikt opened in December 2014 and is a project by Sophie Hardy and Hannes Haake. Their choice of coffee is Fjord, a local roastery run by Silo and Father Carpenter. Father Carpenter have been around since 2014 and are nestled in a beautiful courtyard with a spacious terrace. Kresten Thogersen and his business partner where at the right place at the right time when they scored this prime location close to Hackescher Markt. Since its opening a lot has changed though. In 2016 Kresten started working together with Morgan und James from Silo to take the quality of their roasts into their own hands and to gain independence from other roasteries. The result of that cooperation is Fjord Roasters, which is what hits the grinders at Father Carpenter since. Another development was the enlargement of the café in spring 2017. Due to it's size and the high volume only batch brew is available apart from espresso based drinks and a mouth watering menu. 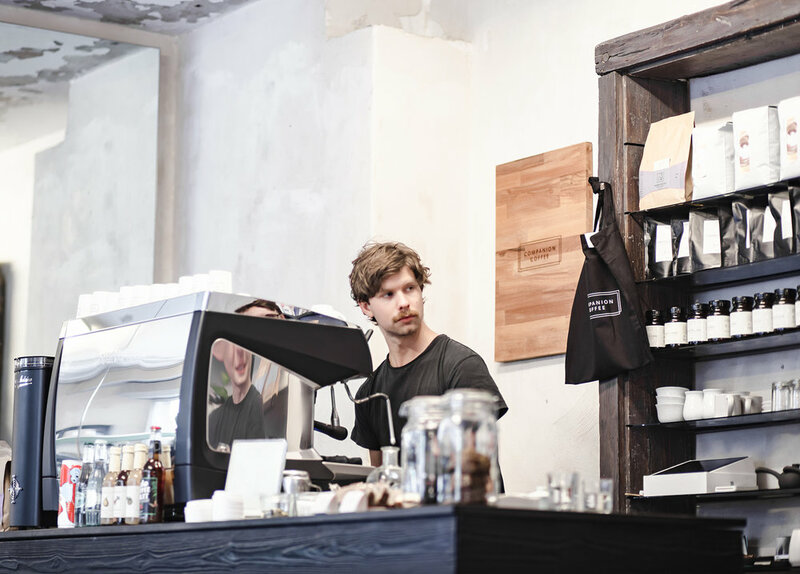 From the beginnings in 2010 until the end of 2016 Sophie and Kris Schackman were running their renowned specialty coffee roastery and café solely from Kreuzberg. Over are the times we had to travel South for their delicious brews and cheesecake since Five Elephant opened up a second coffee shop right in the heart of Mitte. It is more of a take-away place with limited seating and a sleek design that minimizes the distance between barista and customer. The gorgeous custom made counter displaying sweet treats shows once more how serious the Schackman's are about coffee AND cake! Both convince more than ever. In 2015 Tansel and Bora Özbek started the Refinery journey in the heart of Berlin. Refinery is a contemporary space that combines a pure Scandinavian approach to interior design and industrial elements characteristic for Berlin. The coffee shop supports local coffee roasters, such as Bonanza, The Barn and Fjord but also features international coffee heroes like Tim Wendelboe and April Coffee Roasters. Find out more about Refinery in my interview with co-owner Tansel Özbek. Röststätte is a specialty coffee shop, roastery and retail store in the heart of Berlin. Yvonne und Ivo Welle opened up the coffee shop in 2006 and started roasting in the spirit of the third wave movement a few years later in 2011. Their coffee empire expanded further when a show room and barista academy followed in 2015. Röststätte is a distributor and service partner for espresso machines and mills of the brands Victoria Arduino and Nuova Simonelli. 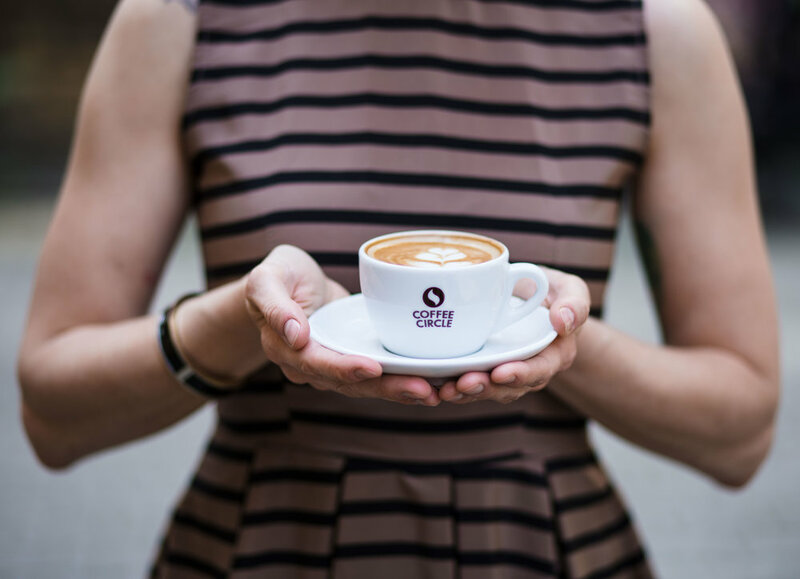 Find out more about Röststätte in my interview with head barista Nicole Battefeld. In March 2018 Röststätte opened their second location in the historic Hackesche Höfe in close proximity to Alexanderplatz. It is a place where more than a century old tradition mingles with the contemporary coffee culture. The interior was designed keeping the Art Décor style of the building in mind, while the coffee equipment is anything but old fashioned. A Victoria Arduino Black Eagle is guarding the hand crafted counter with its green marble topping. While the coffee available is the same as in the roastery at Ackerstraße, fans of coffee and spirits will appreciate the custom made menu which carries drinks prepared with the house liqueur Cold Brew X. Espresso Martini, Negroni and Coffee Daiquiri are just a few of the innovations available here. Another specialty coffee shop tucked away in the backyards of Hackesche Höfe is Ben Rahim. The owner, who gave the shop its name, is a Tunisian national who wanted to introduce Berlin to Arabian hospitality coupled with a specialty approach to traditional coffee. “Coffee is an important part of life in Tunisia", he tells me, while pointing on the Ibirik coffee pot standing on the shelf behind him. During the Berlin Coffee Festival in September 2018 Ben Rahim celebrated the traditional Arab/Turkish way of brewing coffee together with his partner April Coffee from Copenhagen . While this is a great place to discover a different coffee culture the specialty way, espresso based drinks or filter brewed on a V60 are available too. The house blend is the “Red Brick” by Square Mile, who have supported Ben Rahim with quality beans right from the start. Isla is a project run by Phillip Reichel from the Kaffee 9 team and Peter Duran that puts environmental sustainability as high on the agenda as quality coffee and food. 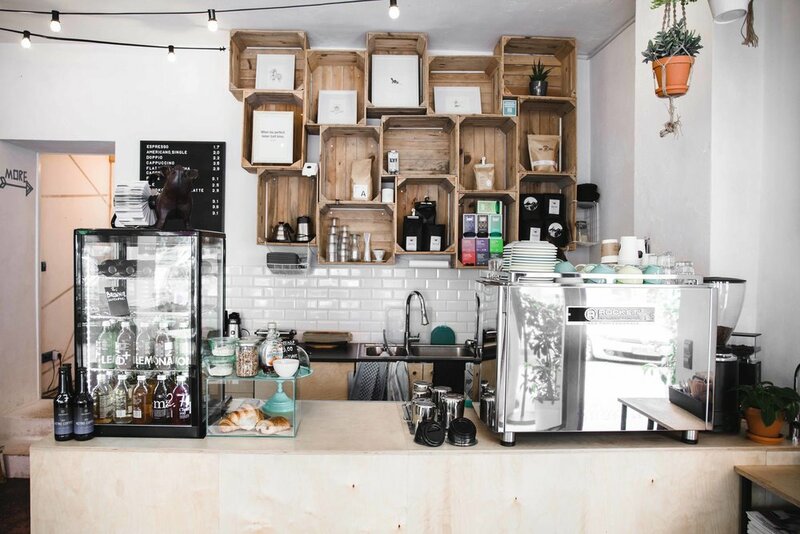 From cups produced of coffee grounds to a zero food waste policy or the use of recycled materials for the interior, it sets new standards that every coffee shop should follow! Needless to say that the weekend brunches are delicious and made from produce that is carefully chosen and local. A regular you'll see on the coffee menu is Kaffee 9 while guest roasters rotate. Currently, April and Prolog Coffee Bar from Copenhagen are available for filter. The second location of Kaffeekirsche has barely been open a week and is already bustling! The owner Turabi Kocadag launched it in the mid-August 2017, wanting to create an inclusive space where everyone in the neighbourhood feels welcome. It is located in one of the most diverse areas of Berlin, right by Schönleinstraße metro station in Neukölln. Coffee is roasted in-house on a 12kg Probat. The house espresso "Dreamteam" is a blend of 70% Brazil and 30% Ethiopia that boosts sweet caramel and fruity notes. Apart from excellent espresso this location is also focusing on Kalita Wave and the Bayreuther Kanne for filter. Before Sarah, who is originally from New Zealand, opened her coffee shop in January 2016 it was all or nothing. Either she was going to leave Berlin behind or start something of her own. I think I speak for every coffee lover in town when I say that I am so glad she took the leap of faith. Nestled in a residential part of Neukölln 'Home' gives locals and visitors alike a place where they could feel, well, at home. The welcoming vibe coupled with excellent brunch options and great home made scones is already reason enough to stop by. But wait 'til you try the coffee! Sarah worked at The Barn for 3 years and stayed loyal to the Berlin based roastery even after she started her own business. It was actually Ralf, the owner of The Barn, that gave her a last push to go through with it. Currently you'll be enjoying La Bandera from Costa Rica for espresso. For filter Copenhagen's April stands in with an Ethiopian, Brazilian and Kenyan options. Beans change every couple of months. What’s really unique about Cafe Kraft is the running crew that has been build around it. Kraft Runners meet here every Tuesday at 18:45 for a free training session - open to anyone bringing good vibes! Black Sheep is a vegan specialty coffee shop run by the two friends Audie and Lucy in Alt-Treptow. They are featuring Berlin based coffee roasters such as Populus. You can choose from 6-7 plant based milk varieties to accompany your coffee and lunch options are delicious and plentiful. Find out more about Black sheep in my interview with co-owner Audie. Even though Coffee Circle isn't a coffee shop, a Berlin map of specialty coffee wouldn't be complete without them. In 2010 the specialty coffee roastery was founded by Martin Elwert, Robert Bach and Moritz Waldstein-Wartenberg. Their goal was and still is today to create a transparent value chain that benefits all stakeholders - from farming, to roasting to your cup of coffee and back to the origin. In Berlin, they are supplying more than 25 cafés, numerous companies and private customers with some of the best coffee in the world. Coffee Circle is located in Berlin Wedding and invites to cupping sessions and other events at special occassions. Check out their online shop to order freshly roasted coffee or the perfect brewing equipment. Sign up for the newsletter to stay up to date for events and receive a 10€ coupon. The Barn revived an emblem of Westberlins café culture when they moved into the Kranzler building at the end of 2016 to open their third coffee shop in Berlin. The iconic building from the 50's, which had always been characterized by its red and white striped canopy, had long been forgotten when Ralf Rüller took the brave decision to bring it back to live. While the terrace and its view is as prominent as ever, the equipment and interior have undergone a massive makeover. The brew bar is equipped with a Mavam Undercounter Espresso machine, a novelty in Germany, and filter is of course hand brewed with high quality coffees. The audience is a refreshing mix of curious Berliners who have known this building for years and years, tourists, and coffee enthusiasts. For more information about The Barn check out my interview with the founder Ralf Rüller. Garcia Kaffeebar in Moabit is a lovely family affair run by Marila and Konrad. Since the opening in January 2015 they've been collaborating with Flying Roasters based in Berlin Wedding to set up the roast profile for their house espresso. Not knowing how the locals in Moabit would respond to a coffee tasting very different from what they are used to, they stuck to darker roasts at the beginning and then slowly moved towards lighter roasts. When I visited, Konrad served a washed single origin from Guatemala that worked really well with milk and left a pleasant taste in my mouth. Just recently they've expanded with a second grinder to start collaborating with other German roasteries too, currently The Barn and JB. As much as I was fond of their specialty coffee, the interior was pretty special too. The washed out yellow walls combined with red chairs create an incredibly cosy atmosphere. Design meets jewelry meets board games meets great coffee! Spontan has everything you need for a relaxed afternoon in the neighbourhood of Moabit. Marie and George opened Spontan in February 2016 and therewith combined their passions and skills to create a truly extraordinary. concept. George loves board games! You can find his corner on the left hand side of the counter where numerous classics can be rented or played with in the store. Marie on the other hand is a goldsmith and her marvelously minimalist and geometric collection is visible in a glass cabinet by the window. Both share a fable for design and have build the interior by hand, which is defined by unique furniture, shades of blue and rustic elements. The multi roaster café is currently featuring a blend by Fjord for espresso. Filter is available on a V60. Other local roasters you'll find here include The Barn and Bonanza. Being the progressive city that it is, Berlin is also a great place to surface some of the discussions that are ongoing in the specialty coffee industry and are in need of our attention and reflection. One of these is the role of women in the industry and how to create more equal and diverse work environments in all areas - from seed to cup. I've met and will be meeting some of the outstanding female coffee people that shape and influence the specialty coffee scene in Berlin. We talk about their careers in coffee, their achievements, opportunities for closing the gender gap and personal plans for the future. This project has no finish line, so do come back from time to time, join in on the discussion and let's celebrate their achievements!